As part of a pilot project, our Icelandic partner Bernd Ogrodnik created two puppets with Down syndrome, which will be used during workshops for children in order to teach the little ones respect and understanding for their peers with cognitive and developmental disabilities. 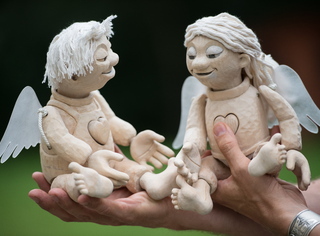 Bernd Ogrodnik, a worldwide renowned puppeteer and marionette creator, agreed to design two puppets, male and female, with Down syndrome, which are supposed to be attractive enough so that children want to play with them. Thanks to that, more than 1350 schoolchildren from dolnośląskie and wielkopolskie voivodeships will familiarise themselves with disability by watching the puppet show, talking to the puppets, learning basic sign language and learning about daily life aids used by disabled people. Bernd Ogrodnik designed, sculpted and built the said puppets. The first presentation of the puppets took place on 13th September 2014 during a partnership meeting in LARCHE Foundation in Wrocław. 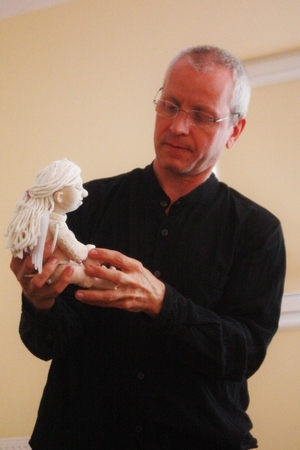 Our partner Bernd Ogrodnik came to Poland to present the two Down syndrome puppets he created, which constitute a basic tool for familiarising young people with the concept of disability. 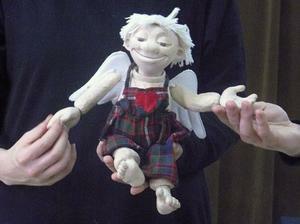 The puppets are made of lime wood and have a built-in mechanism that moves their limbs and wings. 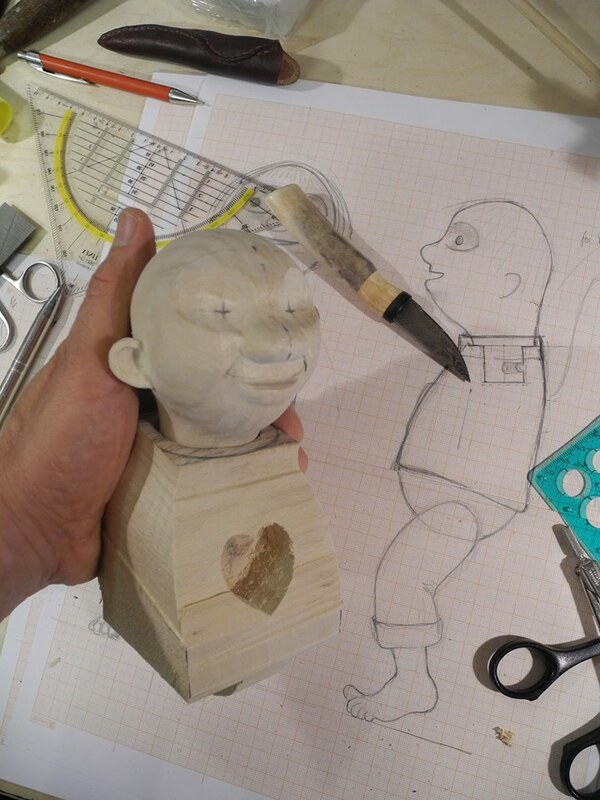 The wood they are made of has been left unpainted (apart from the eyes), because as numerous discussions proved, leaving the puppets in this state will facilitate making copies (which is planned in the future). During the partnership meeting in Wrocław, the puppets were also given names: Szymon and Karolina. The wooden puppets we got are not painted, which makes them look pleasantly, but as children were confused seeing and touching a “naked” puppet (as they would describe it), we decided to dress Szymon and Karolina before setting out for schools. Both puppets are in Poland since October. They were dressed in clothes especially sewn for them. Szymon is used in Wrocław, while Karolina is used in Poznań. Some of the shows were performed without the Down syndrome puppets created by Bernd Ogrodnik, as we did not want to delay the beginning of visiting schools and kindergartens due to the delivery date of the puppets. Nevertheless, the said puppets were used in more than 50% of shows. The puppets were given names: Szymon and Karolina during a partnership meeting in Wrocław (in which disabled people took part, too). We would like to create copies of Szymon and Karolina alongside with class scenarios for teachers and counsellors, so that after our visit each group is left with a puppet and a ready-to-use scenario, as this would help teachers conduct lessons about disability (intellectual in particular). At present, we are looking for some opportunities (both technical and financial) to create puppet copies. We will try to rise founds both for creating puppets and a lesson scenario. There are pedagogues among our team, who, after some consultations with experts, can produce such scenarios. We also intend to invite some intellectually disabled persons to the puppet creation process. The puppets’ maker designed them in such a way that people with mental health condition can participate in the building process, too. Bernd Ogrodnik wishes to be included in the process of material selection for puppet copies and he is willing to help with determining which production stages disabled people could be involved in. Thanks to this project we obtained an extraordinary tool to work with children and, as a consequence, to change their attitude towards the disabled. We want to make the most of it, not only in Poland, but also outside our country by encouraging other LARCHE communities worldwide to such projects.